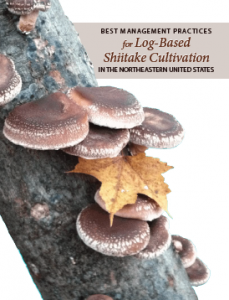 Cornell Cooperative Extension, in collaboration with UVM Extension’s Center for Sustainable Agriculture and a team of farm advisors, have recently published a guide for growers who want to explore shiitake mushroom cultivation on their own land for personal or commercial consumption. Shiitake mushrooms are the second-most cultivated variety in the world, and the demand for locally produced, log-grown shiitakes is high among chefs and consumers alike. According to the guide, “Forest cultivation of shiitake mushrooms can generate income, diversify farm and forestry enterprises, add value to forestry by-products and create opportunities for timber stand improvement.” At publication time, these mushrooms sell for $10-$18 per pound across New England. The guide is the culmination of a 3 year research and education project, sponsored by a grant from USDA-Sustainable Agriculture Research and Education. The project was led by Ken Mudge of Cornell University, and included Ben Waterman of the University of Vermont, Allen Matthews of Chatham University, and Bridgett Jamison Hilshey of the University of Vermont. The project was informed by the experiences of more than twenty shiitake growers producing for market in the Northeast, led by four farm advisors: Steve Sierigk of Hawk Meadow Farm in Trumansburg, N.Y., Nick Laskovski of Dana Forest Farm in Waitsfield, Vt., Steve and Julie Rockcastle of Green Heron Growers in Panama, N.Y., and Steve Gabriel of Wellspring Forest Farm in Mecklenburg, N.Y. The Northeast Forest Mushroom Growers Network is a resource site for growers of all scales, with several factsheets, videos, and a grower directory for the northeastern region of the US. Events and classes offered by extension offices and farmer growers are also posted, with updated events for 2014 now available.